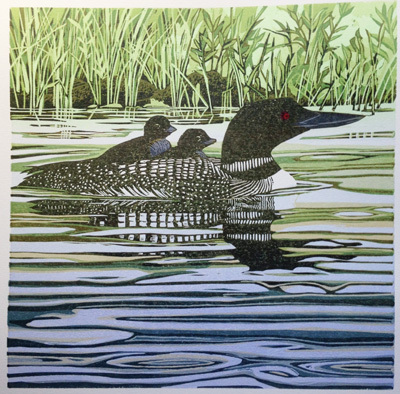 Two weeks out of the studio when the loon linocut was so close to completion was quite a wrench. However, now that I live so close to Hog Island I was able to jump back in to the studio the day after we wrapped up our session and immediately bury myself in ink. It came down to a question of "feel" for the reflection. 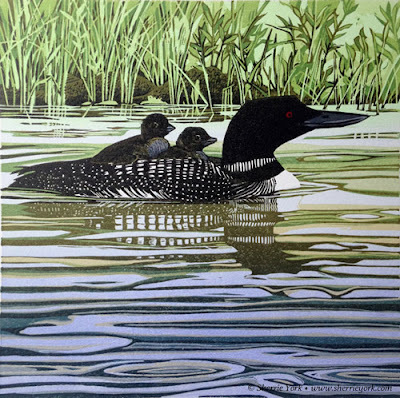 The darker version might have been more true to my reference, but the lighter, murkier version seemed to make the birds the clearer focal point. I consulted a couple of friends and colleagues (thank you, interwebs) and their reactions were as mixed as mine. In the end I went with the lighter reflection. We're in the throes of gray and rainy weather this week, so it will be a few days before I can get a good photograph of the final stage. This one is okay, and if you embiggen the image (click on it) you can get a fair look at it. All that's lacking now is a title... and several days' drying time. This piece has been in the back of my mind since December, when I first agreed to create something for the upcoming International Loon / Diver Symposium hosted by the Biodiversity Research Institute in Portland. That it was another six months before I was able to get to work on it was an unexpected frustration, and it's been weighing heavily on my mind for a long time. 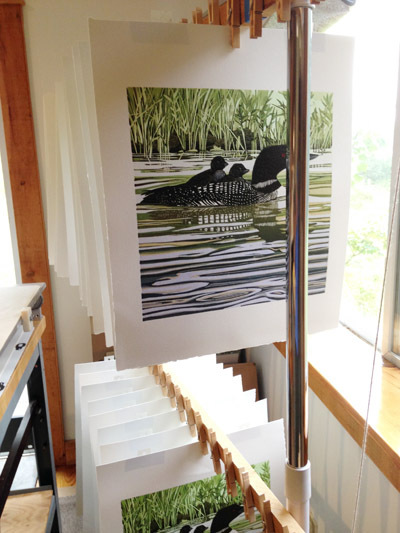 To finally have a drying rack full of loons is immensely satisfying. And it lets me ponder my favorite question: What's next? Yes, that's how I felt, too. It seemed weird at first, but I decided I ought to go with instinct rather than logic. Sometimes that works, eh? What's It All About Wednesday: Here! Linocut in Progress: So much blue and green!